Are you stuck on the slow summer wavelength, too? Let’s embrace it. Let’s sit in the shade and watch the sun go down. Sip on cold drinks. Hop in the pool. Play board games on the porch. Stretch at yoga class. Maybe even do less work (and not feel bad about it). Let’s fill up on big, fresh salads, too. Salads like this cherry stunner you see here. 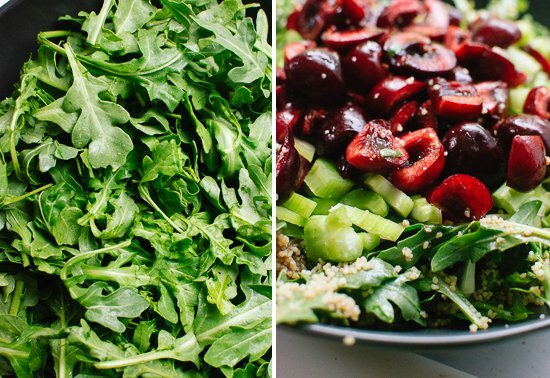 This salad came to be after Whole Foods asked me to come up with a cherry recipe. Any recipe, as long as it contains cherries. Challenge accepted! As a reward, I got a $50 Whole Foods gift card for you (and a gift card for me, too). I don’t do a lot of giveaway posts, but an offer for high quality, free groceries? You deserve a chance at that. Just don’t spend it all on the dark chocolate mini malt balls in the bulk bin section… or do. They’re delicious. The winner will also receive a copy of a beautiful new cookbook that I’ve been meaning to tell you about. It’s called The Vibrant Table: Recipes from My Always Vegetarian, Mostly Vegan, and Sometimes Raw Kitchen by Anya Kassoff of Golubka Kitchen. This cookbook would be great for someone whose diet is both vegan and gluten free. A number of the recipes call for specialty ingredients, but that’s where the Whole Foods gift card comes in. 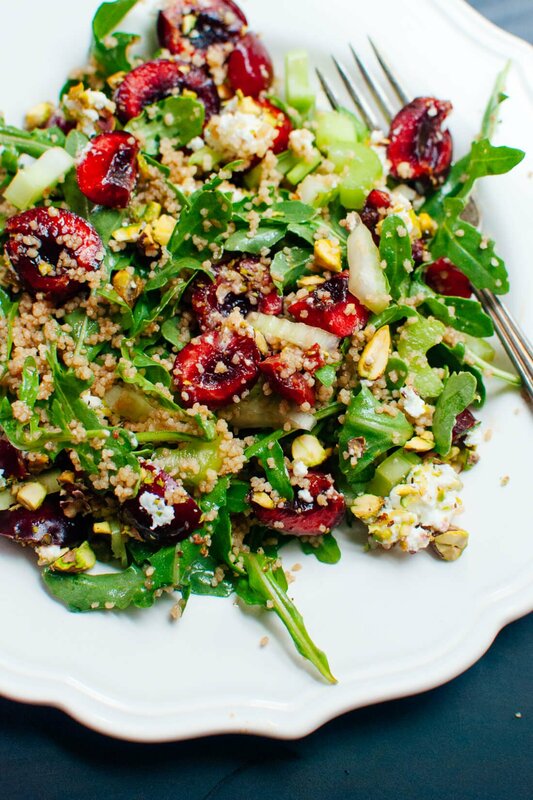 So, this salad features sweet, ruby red cherries, which I rounded out with spicy arugula and some of my favorite Middle Eastern ingredients, couscous and pistachios. I added celery for some complementary crunch and goat cheese for a creamy component. It’s light, filling and very refreshing. I’ve been eating big bowls of this salad for lunch over the past week and plan to make another with plums for lunch today. Feel free to substitute quinoa for the couscous, if you’d like (check the notes for details). Three cheers for summer salads! Update: The giveaway is now closed. Congrats to Allison for winning the giveaway! She’s craving heirloom tomatoes, cherries, blueberries and peaches. Thank you to all who entered. Giveaway details: One lucky winner will receive $50 worth of gift cards to Whole Foods Market and one hardcover copy of The Vibrant Table by Anya Kassoff. Giveaway ends at 11:59 pm CST on Sunday. The winner will be chosen at random and notified by email on Monday. No cash value. To enter, leave ONE comment below. Tell me: what are you craving this summer? 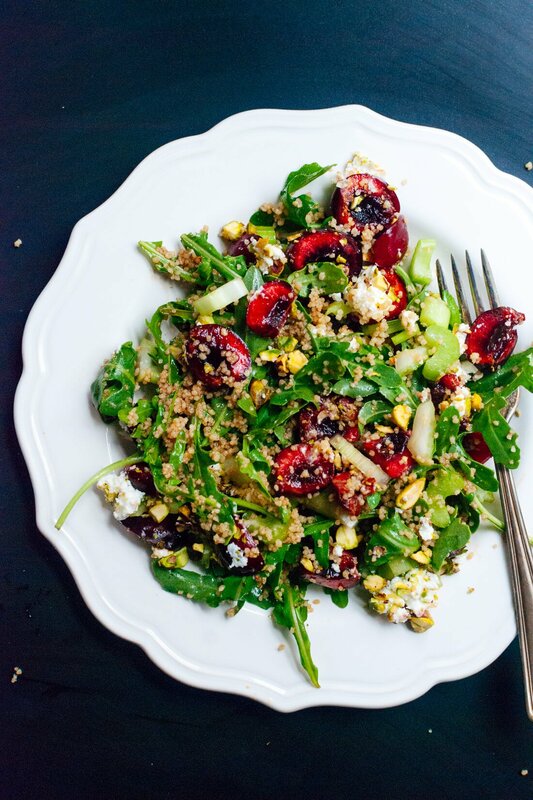 A delightful summer salad featuring fresh cherries, arugula, pistachios and goat cheese (optional) tossed in a simple balsamic vinaigrette. Feel free to substitute pearl couscous for the fine couscous shown here, or quinoa to make the salad gluten free (cook according to package directions and proceed to step 2). To make the couscous: Bring ¾ cup water to boil in a small saucepan. Once it’s boiling, remove the pan from heat and pour in the couscous, olive oil, sea salt and a few twists of freshly ground black pepper. Stir, cover and let rest for 5 minutes. Remove the lid, fluff the couscous with a fork and set it aside for later. To make the dressing: Whisk together all of the vinaigrette ingredients in a small bowl until emulsified. To toast the nuts: In a skillet over medium-low heat, toast the nuts, tossing frequently, until fragrant, about 3 to 6 minutes. Remove from heat and use a chef’s knife to chop the nuts into small pieces. 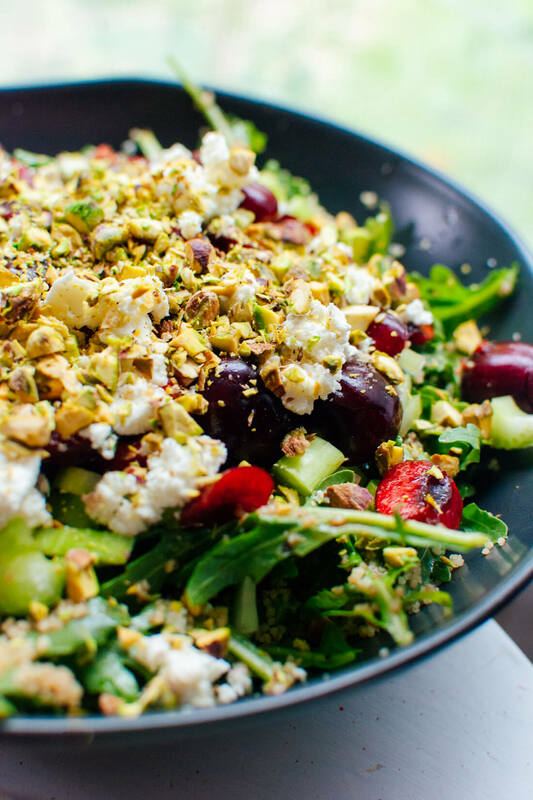 To compose the salad: In a large serving bowl, combine the arugula, sliced cherries, chopped celery, crumbled goat cheese and chopped nuts. Drizzle with enough vinaigrette to lightly coat the greens (you might only need half of the dressing) and toss to combine. Serve immediately. Why buy organic? Conventionally grown celery, cherries and leafy greens are notoriously high in pesticide residues. Make it vegan: Skip the goat cheese and substitute maple syrup or agave nectar for the honey in the dressing. Make it gluten free: Substitute cooked quinoa for the couscous. Storage suggestions: For best results, store the dressing separately from the greens and toss just before serving. Change it up: Feel free to substitute sliced peaches, plums or nectarines for the cherries. You can also use spinach in place of the arugula. Prepare in advance: You can cook the grains and whisk together the dressing. Store them in the refrigerator, covered, until you’re ready to serve. 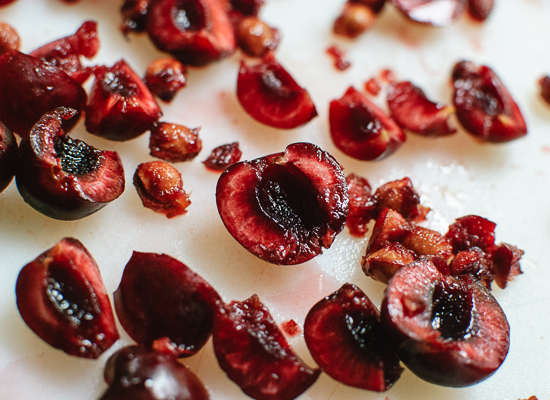 Recommended equipment: A cherry pitter makes pitting cherries a much more pleasant experience. I love this cherry pitter by Oxo. 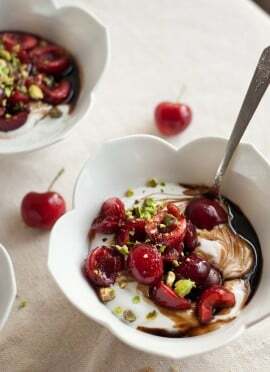 More of my favorite cherry recipes: Check out my vegan cherry chocolate cake, rainier cherry mojito and balsamic stone fruit sundae. I’m craving some kiwi right now. Looks delicious! This is my first summer outside the South in many years, and I’m craving some good Alabama or Georgia peaches. In the meantime, California strawberries will have to do! That being said, this summer I am craving frozen desserts! Like your salted peanut butter and honey ice cream. I have been craving more salads that feel like real meals, not punishments for indulging (like the salad you posted here!). 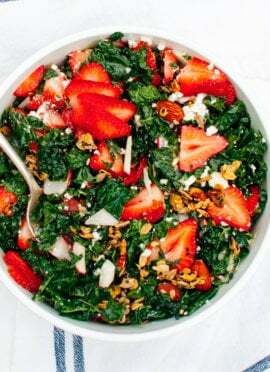 I’ve been craving the time to go through your blog and find more salads like this. I’m craving this and some of that Peanut Butter Honey ice cream! I’m craving a blueberry/milk slushie. I remember my aunt used to drop a handful of the delicious summer berries into a glass of milk and set it in the freezer. After a few hours, viola!, a cool treat was ready to enjoy. Only now I don’t like cow’s milk. I may make it with the fresh goat’s milk yogurt I get from a local dairy. I love your recipes & photos! Keep up the good work! That sounds interesting! I’ve never had a milk slushie. Thank you, Michelle, for commenting! Glad you enjoy my recipes! I am craving a large, green salad with “rainbow vegetables” as my ‘cherry’ on top. (Rainbow vegetables meaning eating every color of vegetable ‘red through purple’ on top of my salad to get the benefits and nutrition from all the fresh summer vegetables around my town! Plus, whole foods ROCKS MY WORLD! Mango Nectarines. Oh, how I crave them!! My goodness, this looks fantastic! I’ve been waiting for an excuse to stop by my neighborhood cherry stand… I think this is it! As far as summer cravings go, I’m absolutely craving watermelon and blueberries all the time these days (my giftcard would almost assuredly be spent on mountains of Oregon blueberries at WFs!). And Salt and Straw ice cream, in Portland! So good. Corn (straight from the cob) and fresh cherry tomatoes are top of my craving list right now. I cannot get enough! Diane, thank you! I hope your treatment is going well. Thinking of you. I am craving peaches, cherries and most of all, the tomatoes that are ripening in our garden! I’m going to have to go with watermelon! After a nice mountain bike ride… yup, watermelon!! I’ve been obsessed with berries this summer, and craving Rainier cherries! I’m craving peaches and cherries! I love the fresh fruit of the season! Im craving watermelon – the season is almost here – we have watermelon now but they arent yet the really good summer watermelons! cherries especially yummy yellow ones are always a summertime love of mine. Also ripe peaches that when you bite into them juice ouzes down to your chin. 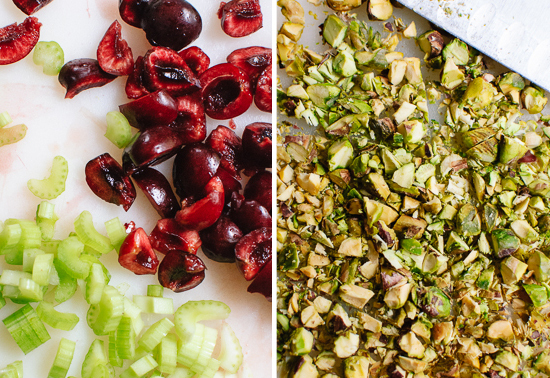 Thanks for sharing this delicious salad recipe…I will certainly need my little sous chefs in the making to help with the pitting of the cherries. Happy Nesting. i am craving a peach cobbler or peach sherbert. Salads! And this one was great! Love your blog…yum. I’m craving heirloom tomatoes and ripe peaches! Love your blog…and have loved everyone of the recipes I have tried! Thank you, Kathleen! I’m glad you’re enjoying the recipes! I am craving tons and tons of sweet corn! I’m craving cantaloupe, so I wish the melons in our garden would hurry up and get ripe! Craving a glass of Rose’ and a dozen briny oysters! This summer is the summer of popsicles for me, and I’m craving Greek yogurt popsicles with fresh local berries. I crave fresh green beans and berries! I love berry season! as a midwestern girl, I’m always craving grilled corn on the cob! I’ve been craving raspberry sorbet – I can’t see to get enough of it this summer. My husband and I are really trying to eat healthy and bringing yummy salads to work is a regular. We’re always looking for a new recipe to keeps things unique and interesting. Thanks for the giveaway opportunity and recipe! Craving every variety of cherry tomato picked fresh from a backyard garden! This summer I’ve been craving watermelon like crazy! I live in Seattle, but used to reside in the South and watermelon is just not quite the same up here (and insanely more expensive!). 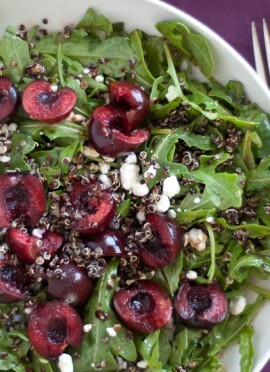 CHERRIES, however, are aplenty here in the Pacific Northwest, so this salad will definitely go on my to-make list! Looks delicious! I’m graving cherries, peaches, corn and my favorite heirloom tomatoes. I could live happily all summer on these. It’s weird, ever since we got corn on the cob for our fourth of July barbeque, I could NOT get enough of it! I ate leftover corn on the cob everyday last week! I also have a huge craving for blueberries and DEFINITELY watermelon. My mom and I finished an entire quarter of a watermelon the other day. And if that wasn’t enough, I’ve been eating mangoes like they’re a new foreign delicacy and I’m in love with peanut butter and banana fake ice cream blended in the blender. Like so many others, I am craving fruit this summer! I didn’t used to pay attention to what fruit is in season, but now I know the glory of a peach in the summertime and apples in the fall! I am craving summer fruits. Getting them from the store or farmer’s market is great but we are trying to grow some of our own moving forward. It’s rather exciting to be able to pick your own! I’m craving fresh fruit like blueberries and peaches. We are craving cherry clafoutis (someday I will manage to recreate my French grandmother’s recipe) and cherries in kirsch (your bourbon recipe inspired us to make something similar). We’re also craving tomatoes fresh from our small urban garden. There are few things in life better than a fresh cut tomato sprinkled with sea salt. I have some beautiful organic cherries from Whole Foods in my refrigerator right now! I have been craving lots of stone fruits-grilled, on salads, topping vegetarian burgers, in crumbles, with yoghurt, or just plain. Also I have been eating a lot of delicious crunchy, hydrating salads with all of the different varieties of lettuces and greens I’ve been receiving through my CSA. I’m craving watermelon – so great for summer! I’ve been craving peaches and plums. Fruit! Pineapple, Berries, Cherries, you name it–if it’s fruit, I want it! To be honest, I have been craving naps- but since this is a food blog I am guessing the “crave” should be somewhat related. In that case, my crave lately has been horseradish….. Weird huh. I am craving cherries and peaches! Thank you so much for all the great ideas. I just recently discovered your blog and I’m addicted. What am I craving? Hmmm…. A low carb Mac and cheese… As well as a pitcher of a beautiful red sangria. Welcome to my site, Jackie! Glad you found it! Love this post! I was looking for something delicious and light for a ‘detox’ dinner after guests were in town for the weekend! Awesome! Thanks, Katie! Glad you enjoyed the salad! Every morning I eat plain Greek yogurt with fresh blueberries and homemade pumpkin granola. I crave it all day long. I’m craving it right now! What a great way to use cherries! (Though I have a hard time getting them past my mouth and into a recipe when I take them out of the bag!). One of my favorite summer indulgences is vine-ripened heirloom tomatoes in all sizes and colors! Right off the plant or chilled, sliced, and drizzled with fresh basil pesto. I am craving summer fruit. I love blackberry season and I’m craving blackberry pies. Utah peaches! Always a treat at the end of a summer! Can’t wait! Thank you, sweet Laura! I hope you love the salad! Oh how I love how you help me use my produce! I would like to praise the celery in this one–perfect addition of crunch and that “green” flavor. Everything else in it was great, too, but celery so rarely gets praised so I want to give it a shout out. Thanks, Anne! I’m glad you appreciated the celery. It’s totally underrated! 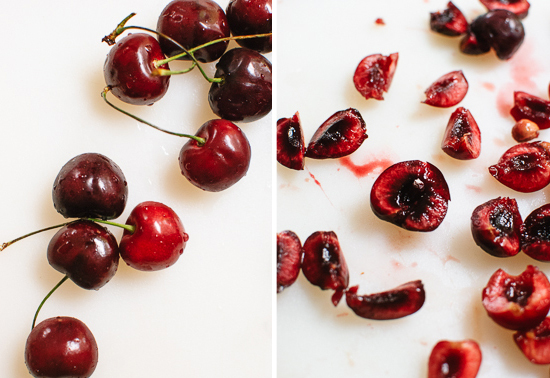 We just made this with the very last of the local cherries (sob, sob!). I subbed tri-color quinoa for couscous, walnuts for almonds (we were out of almonds. How are we out of almonds?! ), fresh corn for celery (nobody in my family appreciates celery, myself included), and agave for the honey. My mom hates goat cheese but my dad and I LOVE it- it’s the only non vegan thing other than honey that I will gladly make an exception for. So I set aside some for her and dumped a whole big bunch of goat cheese in for the rest of us :). It was awesome! Love how the tart balsamic played with the cherries and the corn! And, as always, when my dad asked who this recipe was from- “Slaw Lady.” “Ahah! Slaw Lady! She knows what she’s doing.” HAHA! My mom wants to add that she thinks yellow bell peppers would be a nice addition as well. We will have to give that a go with next summer’s produce. Thanks for another stellar recipe! Thanks, Ella! Glad this salad got some thumbs’ up from your family! Your substitutions sound great. Bell pepper would make up for celery’s crunch. I think veggie plates ruined celery for most people. I don’t particularly like it plain, but I really love it chopped up in salads! Hi Kate! I’d really like to try this, but I’d have to adapt this for the fall season, since all the cherries are gone. I was thinking subbing kalamata olives for saltiness instead of sweetness, or a fall fruit like apples. What do you think? By the way, I’ve been following your blog for a while now and have tried many of your recipes–all great! I’m currently devouring your pumpkin muffins without moderation…! Thanks, Lorel! Good question! I bet apples would be nice, or kalamata olives for a simple Greek-flavored salad. Pears would be good, too! Glad to hear you’re enjoying my recipes! Just had this for dinner and it was just as amazing as it looked! Firstly I love your blog! I actually learned to love to cook because of it! Your recipes are so easy to follow and they are so varied and filled with easy-to-find and tasty ingredients! I have made this salad before and it was delicious!! Cherries aren’t in season anymore, you think blueberries would be a good substitute? Thank you so much, Talya! That’s fantastic to hear. :) I bet this salad would be awesome with peaches, blueberries or strawberries! I got a big beautiful bag of cherries at the store this weekend and was wondering what to do with them. How great to see this recipe in your “What to cook this June” round-up. The flavors are wonderful and it’s exactly what I was craving on this hot June evening. Also, your cookbook also arrived in my mailbox this week. I love it! I’ve already made the mango yogurt with coconut muesli, as well as the Greek nachos. Thanks for writing such a gorgeous book! So much goodness in this comment, Kelley! I’m glad this recipe came right on time for you, and that you love the book! So I’m guessing, based off the pictures, that the couscous gets mixed in with everything else, too. ;) We used quinoa and substituted water chestnuts for the celery. Jicama would be good, too. This was delicious. Thanks, Erin! Water chestnuts are a great substitute for the celery–I’ll keep that in mind next time the celery-averse ask for a swap-out! Hello! I just made this salad for lunch today and it was delicious! I subbed plums for the cherries and bulgur for couscous because that’s what I had on hand. I really loved the dressing with the sweetness of the plums. Even my brother, a self-confessed carnivore, really enjoyed it! This was absolutely fantastic! I was too lazy to pit the cherries, so I just tossed them in, and I added avocado. Thanks so much for this delicious recipe. I always look forward to your posts.